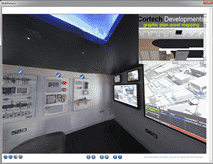 Cortech Developments have released a new 360⁰ Asset Mapping system as an added value solution, which is linked dynamically to our Datalog graphics package for Building, Fire and Security Management. The 360⁰ asset mapping for your buildings enables you to zoom in and out of areas to pinpoint control equipment such as fire, intruder, access control panels and much more. Upon highlighting an individual piece of equipment you can access a wide range of documentation [that you choose to store in that portal] specific to that panel such as operating / installation manuals, datasheets, guarantees etc. 360⁰ asset mapping provides a very powerful tool for responding to events, when time is critical.